18 months ago, we looked at Creative's Zen. This was a flash-based portable media player capable of holding its own against the iPod Nano. Creative has refreshed the Zen as the Zen MX, but is it still up to the job? Aside from the rebranding, the only aesthetic difference between the Zen and the Zen MX is the "hold" switch, which has been replaced with a menu option that can be dedicated to a soft key. Other than that, the same features we loved about the Zen have been retained: the ability to add SD cards to effectively double the capacity, the intuitive menus, and the excellent (albeit not OLED) screen. Creative has thrown a spanner in the sleek Zen works, though: it won't natively play any video files. The original happily displayed almost everything we threw at it, but the MX requires videos to be converted to proprietary .CMV on your PC. The screen is so small that you won't be watching anything more than 30 minutes long, but it's still a hassle. Another feature we loved about the original Zen has been dropped. The ability to play Apple's AAC files, without conversion, meant the Zen was a good replacement for the iPod Nano. Unfortunately, this too has been removed. As with video, you'll have to transcode files yourself. 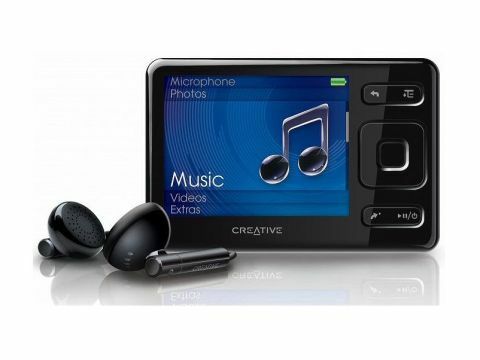 It's a shame Creative has dropped so many features, and it seems unwise in the face of the latest iPod Nano. A couple of nifty tricks like adding a video camera and a pedometer have surely put the new Nano on many Christmas wishlists. It could be that Creative is merely seeking to eke out this Zen model (and its production process) just a little longer. Creative's Zen X-Fi II, with its touchscreen and wireless capabilities, is going head-to-head with the iPod Touch. And the hi-def video capable, Android-powered Zii Egg - based on Creative's homegrown Zii processor - is promising great things for users who want to get more hands-on with their portable media players. We singled out the features like AAC and DivX support as reasons to buy the original Zen, but now they're gone it's substantially devalued the player. If you're looking for a new Creative portable media device, we'd recommend seeking out the Zen X-Fi over the Zen reissue. It may be slightly more pricey, but it's far more versatile than the MX and has better sound quality.